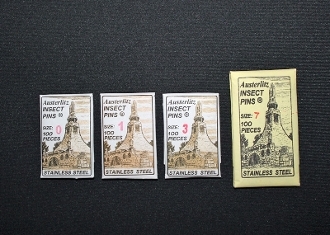 Austerlitz is a highly respected brand of professional, entomological grade pins from Europe. We prefer these ones with stainless steel shafts and nylon heads, though they are more expensive for us to purchase than the dull black ones. They are rust proof. Available in the three sizes we tend to use most. 100 Count Size 0 (zero) Pins measure 33 mm in length and have a diameter of .35 millimeters. These are best for pinning very small or soft-bodied specimens. They bend easily and are not useful for pinning specimens with harder cuticles (shells, exoskeletons, etc.). 100 Count Size 1 Pins measure 38 mm in length and have a diameter of .40 millimeters. Useful for pinning small specimens. 100 Count Size 3 Pins measure 38 mm in length and have a diameter of .50 millimeters. Useful for pinning small to average sized specimens. 100 Count Size 7 Pins measure 52 mm in length and have a diametera of .70 millimeters. Used for pinning very large specimens like giant rhino beetles.